I remember back in the late 80's some proto-grunge guy from the college radio station mocked me for going to see the Godfathers. "They wear matching suits!" he scoffed. That was before Urge Overkill made it cool again. I like a band that wears matching outfits, it shows that they are making an effort to entertain me. It doesn't make a crappy band sound good, and it doesn't fit every band -- Guided By Voices' whole thing was "we're regular guys", so they wore regular-guy clothes, but they still busted their asses for the ticket-buying public. 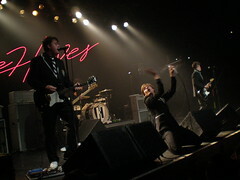 The Hives are like that--they did everything possible to get the crowd going last Thursday at First Avenue. They reminded me a lot of the Godfathers, what with the suits and the 60s-style garage rock. The main dig against them is that they aren't original, but if, like me, you can't resist the primal lure of garage rock, originality doesn't really matter. If I'm offered a mouth-watering slice of cheesecake, what do I care if someone else make a similar one 40 years ago? That one guy from the Monks died, so I'll probably never see them live. Give the Hives credit, though, not many garage rock bands had more than one good single (there's a reason why the most famous garage rock record is Nuggets), and they've had three albums chock full of catchy songs. Most of the 80s garage rockers like the Fleshtones and Joe "King" Carrasco and the Crowns killed live, but their albums were pale reflections except for one or two songs. Now, if only The Hellacopters and the Nomads will come to town, for the Swedish garage rock trifecta . . .